The Flying Eagle Cent was minted for only three years so the values are skewed in favor of the 1856 since it’s extremely rare with a mintage of only 750. The 1856 Flying Eagle Cent value in G4 is $7,000. The 1857 and 1858 large and small letters types are the most numerous and can be bought for as low as $15 in grades G4 and lower. 1856 is valuable in any grade and you must watch for fakes and altered coins made to look like 1856. The 1858 and 1857 are worth $150 starting in EF40 (extremely fine) and more than double in value for AU (about uncirculated) and continue to do so into the MS (mint state) grades. Cleaned coins will always be worth less. 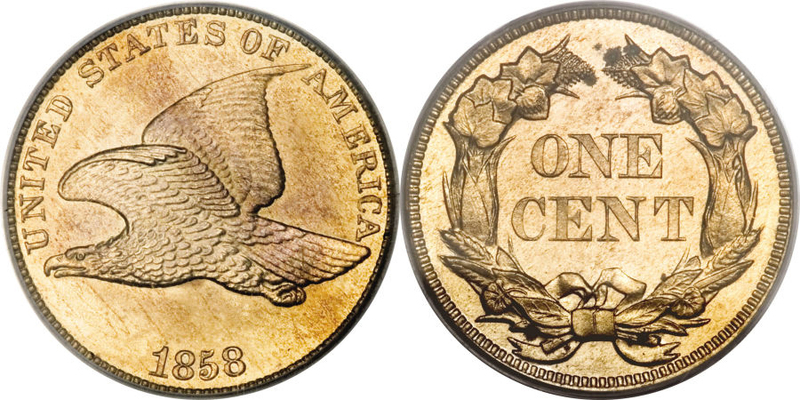 To realize the lofty premiums of mint state Flying Eagles they must be graded by services like PCGS or NGC or ANACS. The most popular variety is the 1858/7 but there’s several other listed varieties that are worth more, so look for doubled dies, repunched dates, 1857 Type Of 1856, and several examples clashed with other denominations. You should always do your research and learn about Flying Eagle Varieties before buying or selling then since not all varieties are worth a lot of money and some are similar and not the same. You don’t want to buy the wrong variety for too high of a price because it looked similar to the most valuable variety. This is not much of a value factor since any Flying Eagle Cent, in any grade and condition is worth more than their precious metal content. Flying Eagle Cent value for 1856, 1858, 1857 dates, grades and varieties.